The patients were rushed to the health centre where they have been currently undergoing treatment. 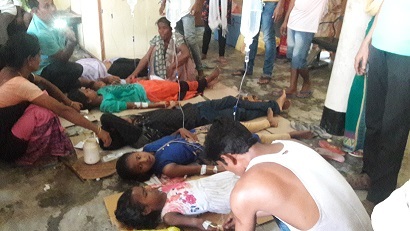 Members of students’ bodies and locals in large number visited the health centre to take stock of the situation. “We took part in the naam-prasanga and consumed chickpea (but) and laddu which were part of the prasad served to the devotees, following which I along with my two children suffered uneasiness and started vomiting,” said a patient Lakhi Priya Lahkar. Insecticide-treated pulses have been detected as the prime cause for prasad poisoning cases. According to experts, chick peas (but) and green grams (magu) are treated with high doses of insecticides before being exported to States like Assam – where there is high demand of these pulses – from the producing States. This is done so that the pulses can be stored for a longer period.